Click to enlarge. Left: full view. 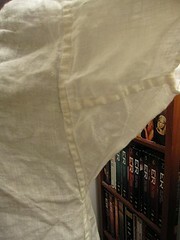 Right: underarm gusset. Notes: Made in March 2009. Stitched mostly by machine. I took some of the width out of the pattern, but that was the only modification. I actually made three of these, so I would have a clean change at multi-day events. 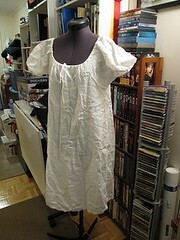 The three are identical, except one was pieced in the back, since I was running out of fabric.